If you're like most parents, you dread the moment your baby starts teething: the pain, fussiness, and general uneasiness. 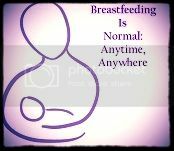 You'd do anything to relieve your baby's discomfort and see him or her smile again. There are many teething medicines on the market but with so many recalls and dangerous ingredients even among some of the natural remedies, what's a parent to do? There is hope! 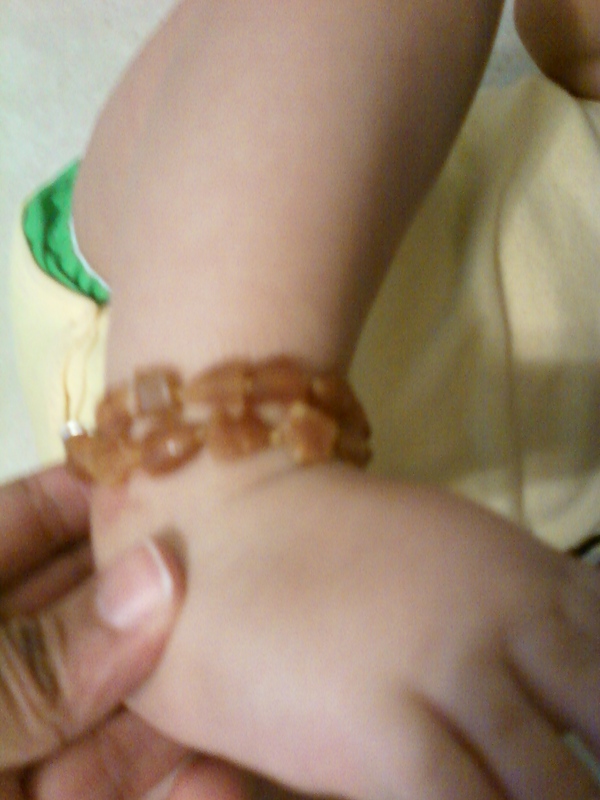 Enter Baltic amber teething jewelry. The Baltic region contains 80% of the world's amber and Baltic amber is the most prized amber in the world. Baltic amber is the fossilized resin from pine trees that grew in the Baltic region about 45 million years ago. Amber is a warm to the touch gem and, when worn against the warmth of your skin, it releases healing oils. These oils contain succinic acid. Baltic amber contains a higher amount of succinic acid than any other amber in the world and that is why it is so highly prized. Succinic acid is a natural analgesic (pain reliever) and also has anti-inflammatory properties and has been used in Europe as a natural teething remedy for centuries. Baltic amber can also be used by adults and also helps with strengthening the immune system, restoring energy,maintaining wellness, and reducing chronic inflammation. 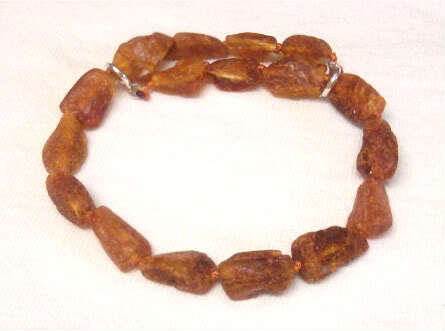 Baltic amber can also be used to help with anxiety, depression, relieve stress and help maintain emotional health. Traditionally, babies wear amber teething necklaces around their neck for teething. However, Daniel is really curious and just has to touch everything so my husband and I were really worried about putting a necklace on him and were glad to find that an anklet can be a good alternative. There are many people out there selling fake amber so I must tell you what happened to us. We went to a festival and there was a man who was selling loose amber beads, amber chunks with inclusions, and a few necklaces. He recommended that we buy 12 polished beads at $2 each to make Daniel an anklet and even threw in some stretchy string for free. Daniel had seemed really uncomfortable with serious teething symptoms so we were really excited and did as he said. When I tried to make the anklet, I realized I did not have enough beads, the stretchy cord would not work and I had no idea what I was doing so I did some research online. I found that we paid way too much for the beads and I could have gotten a necklace or anklet for that price or even cheaper. I also came across a few posts on how to tell if the amber is real or fake and found that my beads were fake! I was very angry but the festival was over and nothing could be done. Then a friend recommended Inspired by Finn. She said they were a trustworthy company and she has one of the necklaces for her son. I did my research and found that they offer a 9 1/2" adjustable raw amber anklet as an alternative to a necklace and we decided to buy that. I contacted Inspired by Finn and they offered me a generous discount and I ordered the anklet. The customer service was excellent. I emailed them late one night and had a response early the next morning. Everyone was very friendly. I ordered my anklet and received it within 2 days even though the website said it would take 3-5 days with first class mail. I was very pleased with the quality of the anklet. There is a double knot in between each bead so if the anklet breaks, beads will not scatter everywhere and it has an adjustable clasp which means one size fits most and Daniel might never outgrow his anklet! The anklet is made of raw amber beads which have not been polished or shaped in any way and I was worried it would be ugly but it is very nice looking for a boy. Raw amber contains the most succinic acid and on the Inspired by Finn website it says they have done some studies that show a full 9 1/2" of raw amber as an anklet is a good alternative to the necklace although it might not work just as well. I did my tests and found that the amber is authentic. Daniel doesn't mess with the anklet too much since he's usually crawling around and not playing with his feet. The website recommends wearing socks over the anklet to keep it warmer and I will try to do that when we are at home in the air conditioner but now when we go out as it is very hot here in Florida right now. The anklet has not been irritating to his sensitive skin at all. Unfortunately, Daniel has no teeth and is not showing any teething discomfort at the moment so I cannot say whether or not the anklet works so I will have to write a "part two" to this post when his first tooth appears. A few tests to determine whether your amber is real are: Put it in a bowl of 1 part salt to two parts water. Real amber floats in salt water. However, my fake amber passed this test. rub it in between your hands. Real amber becomes really warm when you do this but this test is highly subjective. Wet a cotton swab with nail polish remover and swab a bead with it. Real amber will not be affected but fake amber will melt. This is what happened with my fake amber beads. My Inspired by Finn anklet survived this test of authenticity. Inspired by Finn teething necklaces start at $20.95 depending on size and style and the anklet is $26.95. They also have adult amber jewelry as well as child and adult hazel wood jewelry. Inspired by Finn has been generous enough to offer all of my readers 25% off any purchase! With such a great offer and all of the benefits of natural Baltic amber, why not try one today? Visit Inspired by Finn and use code "Taisha" at checkout to get your discount. Once 15 items have been purchased, I will be hosting a giveaway here and the winner will receive a free item of their choice. Please leave a comment here letting me know how many items you purchased so I can keep track for the giveaway. I will be checking back with you soon for "part two" of this post and the giveaway! Okay, I have a friend whose baby has one of those necklaces, but she never told me WHY! I thought she just liked the way it looked! Thanks for the info...I think she may be on to something! You're welcome Tammy. The anklet has really worked great for us and I definitely recommend it. This blog makes a good review regarding teething anklets. Love reading your blog!